For decades, organizations have managed risk at the information systems level. 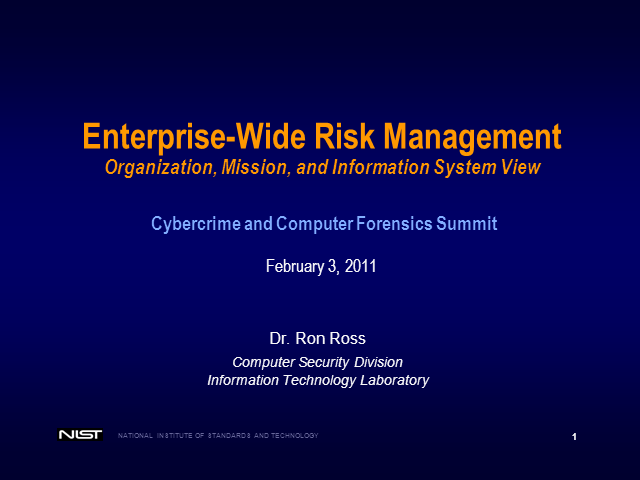 This information system focus provided a very narrow perspective that constrained risk-based decisions by senior leaders/executives to the tactical level—devoid, in many cases, of any direct linkage or traceability to the important organizational missions/business functions being carried out by enterprises. The concentration on information systems security by organizations resulted in a focus on vulnerability management at the expense of strategic risk management that is applied across enterprises. NIST Special Publication 800-39 introduces a three-tiered risk management approach that allows organizations to focus, initially, on establishing an enterprise-wide risk management strategy as part of a mature governance structure involving senior leaders/executives and a robust risk executive (function). The risk management strategy addresses some of the fundamental issues that organizations face in how risk is assessed, responded to, and monitored over time in the context of critical missions and business functions. The strategic focus of the risk management strategy allows organizations to influence the design of key mission and business processes—making these processes risk aware. Risk-aware mission/business processes drive enterprise architecture decisions and facilitate the development and implementation of effective information security architectures that provide roadmaps for allocating safeguards and countermeasures to information systems and the environments in which those systems operate.